Please complete and submit the form. Maximum of 500 characters allowed. Currently Entered: 0 characters. The color of a yellow bird is? Need help? We're just a phone call away. Contact us now to make an appointment to discuss your accounting and tax needs. 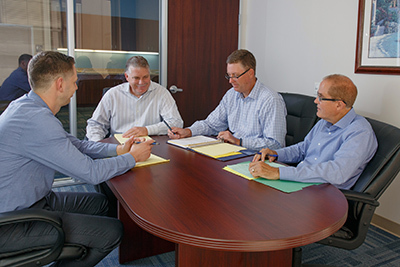 Carpenter, Petersen & Associates has been our accounting firm for several decades. Under the direction of John Carpenter, we have consistently enjoyed CPA's high level of expertise and professionalism. CPA's handles our routine matters plus the special circumstances that arise from time to time-and always in an expedient and reliable manner. We know that John and his capable team are always just a phone call away. Our company has been using the audit services of Carpenter, Petersen & Associates, CPA's for more than 20 years. They are responsive to our questions and needs in a timely manner and have assisted with other various projects over the years, in addition to, our annual financial audits. We have had the opportunity to work with several of their staff and they have all been thorough and professional at all times. Our Company and our family businesses have been using Carpenter, Petersen and Associates for over 40 years. They have guided us through tax audits from Federal, State, and local agencies. The firm has produced quarterly and annual financial statement reports for all of our entities, including more than 16 annual income tax returns. John Carpenter and Dave Petersen have provided us with invaluable business advice over the many past years and have represented us with many of the agencies, banks, and companies requiring financial information from our businesses. Dave Petersen is always responsive and knowledgeable when my clients need assistance. In fact, Dave was the saving grace for one of my clients when he found errors with prior tax returns and was able to get an unexpected tax refund of nearly $1 million dollars. Needless to say, our mutual clients continue to seek Dave’s guidance with their business and personal accounting needs. Furthermore, I trust Dave with my own taxes!